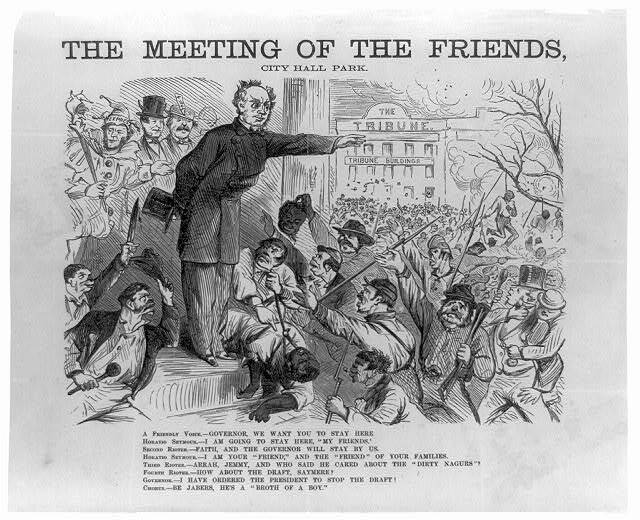 Description: New York governor Horatio Seymour’s famous “My Friends” speech, delivered from the steps of New York’s City Hall during the draft riots, was widely misrepresented in the press. On the basis of reports such as this, Seymour was viewed as a disloyal “Copperhead” agitator. The riots, which took place between July 11 and 16, 1863, broke out as a result of the Enrollment Act, which was highly discriminatory to the lower classes.